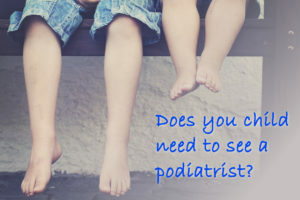 Is your child complaining about painful feet/legs “growing pains” particularly in the evenings? Does your child limp after running or playing sport? Is your child clumsy or constantly tripping? Do you think your child is walking ‘funny’? Are they walking on their tip-toes, do their toes point inwards (pigeon-toed), do they have flat feet, do their knees point inwards or are their ankles rolling in (or out)? Do they look different to other children their age when walking or running? Have your child’s shoes worn through quickly or unevenly? If you or your child answered “Yes” to any of these questions, a thorough foot check is the first step to getting them back to their best. Help your child get off on the right foot; ready to tackle whatever comes their way! Call Feetology Podiatry Centre on (07) 3820 6326 to secure an appointment with one of our friendly podiatrists or you can book online. This entry was posted in Blog Posts on June 28, 2018 by Feetology.